Further checks allow me to be more precise concerning the history of Krausmann’s Tavern in Montreal. The main points in my last post are correct, but I add below considerable additional detail, including from a beer standpoint. The Montreal Krausmanns, two brothers, were not from Lorraine in France, or even from Europe. They were from Elora, Ontario. Elora is a charming, small town about 70 miles from Toronto. The patriarch, Andrew (né Andreas) Kraussman, was born in Hesse, Germany in 1844. He immigrated to Ontario and became a successful innkeeper, then hotelier. His wife was Sarah Poutler/Paudler/etc. – spelling varies in different accounts – born a year earlier. Interestingly, she was from Alsace-Lorraine, which may well explain the origin of the name, “Kraussman’s Lorraine Cafe”. Lorraine in France is mainly French in culture but with some German influence via its Moselle part and the adjoining Alsace has a distinctly Germanic tone to this day. Lorraine Cafe may have been considered a good name for a German-style restaurant in Montreal given the dual French and German associations. Also, there is a town called Lorraine in Quebec – I was there only two days ago in fact, attending a wedding. Andrew and Sarah married in Canada in about 1866. The family was Catholic and I mention this simply because I had thought initially the Krausmanns might be old Mennonite stock. That part of Ontario was settled to a large degree by Mennonites of different orders, they came as early as the late 1700s. The Mennonite churches are connected to Anabaptism and the Reformation, so had the Krausmanns been old stock I’d expect them to be Protestant. But Andrew and his wife came to Ontario in the third part of the 19th century. The family expanded hotel-keeping to Toronto and owned Krausmann Hotel at King and Church Streets – the location is now an empty lot as the building was taken down in 1970. Most of Andrew and Sarah’s children followed them in the hospitality business. There were five boys. One, Albert, died in 1915 at only 33. Andrew died the same year. 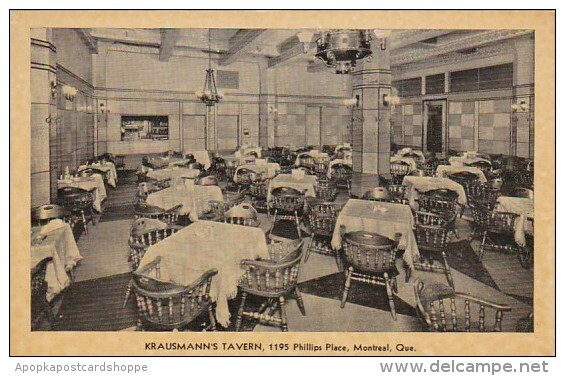 John, who had developed the family’s expansion in Toronto, founded Kraussman’s Restaurant in Montreal in 1901, but not in Phillips Square, it was on 80 St. James Street, or Rue St-Jacques, the official name. This was in the old financial and historic quarter of Montreal. As will appear, the cuisine was German and appropriately, John specialized in imported German and Austrian beer. 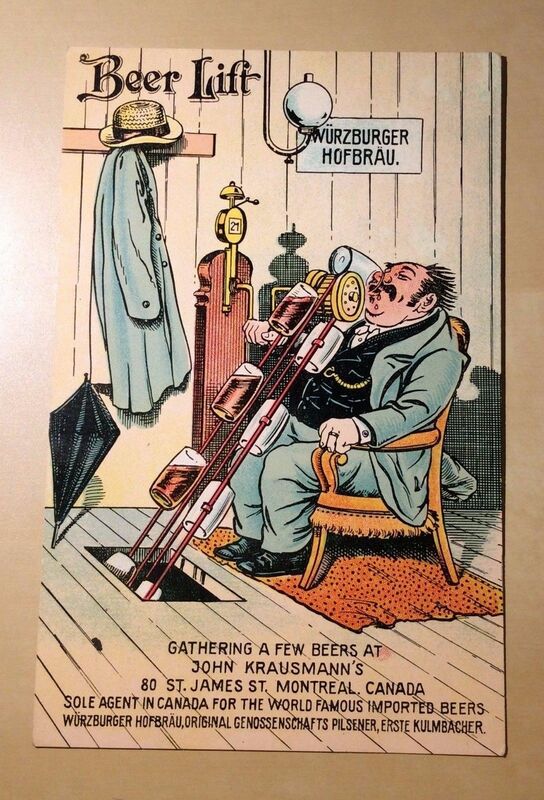 The amusing post card (pre-WW I, probably) shown below includes top international brands of the era. After almost 30 years in business on St. James Street, John died of a gunshot in February, 1929, perhaps by his own hand. The account in the Montreal Gazette gives numerous details. I don’t know how much longer Kraussman’s on St. James Street continued. Certainly by the 1970s in Montreal, there was only one Krausmann’s, in Phillips Square. John had left no children. John’s younger brother, William, founded Kraussman’s Lorraine Cafe in Phillips Square in 1922. That restaurant also was a success, but William died of a heart problem in Montreal in 1933. This obituary gives a respectful treatment of his career: he had obviously made a mark on the city, as had John. William left a son, William Jr., and two daughters. Two brothers survived William and John: Andrew junior, and George, who became a noted physician in Detroit, Michigan. Krausmann descendants continued to reside in Montreal for many decades. Some may have been involved with Krausmann’s in Philips Square in the 1970s, maybe even after it moved south to Beaver Hall Hill in the 1980s. I believe the current ownership of the successor, Brisket, is unconnected. In November, 1928 in Goblin, a New Yorker-style magazine published in Toronto in the 1920s, a deft portrait is given of the two restaurants, see here. (Blogger John Adcock has given some interesting background on Goblin, here). The fame of Krausmann’s has gone as far as the pages of “Vanity Fair”, and the sidewalks of Chicago. There’s a place (or rather two places, Krausmann’s on St. James Street and Krausmann’s of Phillips’ Square) that the tourists “do” know. Krausmann’s on St. James Street is the old original, still run by the famous John Krausmann, but both restaurants specialize in the same sort of Teutonic food. Visitors with a culinary background of Hassenpfeffer, Apfelstrudel and other delicacies invariably think Krausmann’s is a wow. The Kasslerripehen at the Phillips’ Square restaurant is excellent. Interesting too, if you care for that sort of thing, are the various kinds of imported German sausages and the enormous plates of pigs’ knuckles and sauerkraut that are served at the bar. Oddly enough, you can’t get Pumperknickel at Krausmann’s. I asked for it one day and was told they stopped baking it during the war and had very few calls for it nowadays. During the summer, Krausmann’s, St. James Street, has a steady supply of fresh-caught brook trout, which they cook to perfection and serve with “beurre noir”. Clearly the pig’s knuckles was a house specialty, and would have been since 1901. You can still get it at Brisket today, which occupies the last location of Krausmann’s Tavern, made to the original recipe. * Albeit it flies under the radar these days the dish has been continuously served for 115 years, which must be some kind of record and deserves the renewed attention of Montreal’s food culture. Brisket’s continues the Krausmann legacy in three ways I can see: first, in its full name, “Brisket Montreal – le Salon Krausmann“. Second, the restaurant features the famed Krausmann pickled pork hocks, so some small part of the original menu survives. Third, Brisket is a “brasserie” which in Montreal means a restaurant serving hearty foods with a good beer selection – Kraussman’s in the 70s was the same concept except continuing to offer the pork hocks as a connection to the past. The reference to pumperknickel bread in the Goblin story is interesting. I wonder if the restaurants stopped offering it because black bread is an obvious symbol of German cooking and culture. Maybe Krausmann’s wanted to lower an obvious part of its German profile since Canada was fighting Germany in Europe. Yet that war, and indeed the Second War, seemed not to affect the fortunes of these German-Canadian restaurants. On the eve of WW II anyway I know Kraussman’s was still advertising its German menu. Maybe this changed during the 40s though, in fact I think it is likely. By the 70s the menu was mostly Canadian, or such is my recollection after a mere 40 year gap. Above is an image of the hotel the family operated in Toronto. It is now a parking lot. I drive or walk by it quite often, never having dreamed the site was connected to the Kraussman Tavern I liked so much in Montreal c. 1980. In the same manner, never would have I thought back then that a tavern with an interesting signature dish had such a rich history, going back to swish times in early financial Canada, over to rural Ontario where its founders were born, and stretching finally Alsace-Lorraine, whence the sturdy and tasty porcine specialty of Kraussman’s probably came. Note re images above: The first, showing the interior of the Phillips Square Krausmann’s mid-1900s, was sourced from this Delcampe.net auction page. The second, a postcard showing the St. James Street Krausmann’s (probably pre-1914), was sourced from this ebay page. 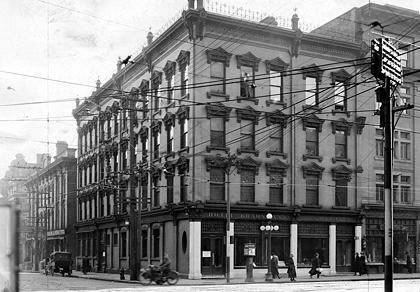 The third image, of Krausmann Hotel in Toronto c. 1918, was sourced from a Toronto urban history site, here. All are believed available for educational and historical use. All feedback welcomed. ADDENDUM: SEE MY NEXT BLOGPOST FOR PART III OF THE KRAUSMANN RESTAURANT SAGA IN MONTREAL. *See my note added April 1, 2018 in the Comments under Part I.